The teaching that Peter was the rock upon which the church was built surely came from either an ignorant mind or a polluted one. I hate to base my explanation on grammar because it is not what I believe as the bastion of truth. But simple grammatical knowledge might help us see the way to logical truth. Aware of the way the Lord Jesus Christ constructed sentences throughout all His sessions of teaching, we will not, in our wildest dreams, think that the Lord Jesus has a propensity of making ungrammatical and nonsensical statements. The foregoing sermon can be considered scholarly constructed with utmost literary style and beauty. No learned scholar can accuse the Lord Jesus Christ of speaking nonsensically nor ungrammatically at any instance in the Holy Scriptures! 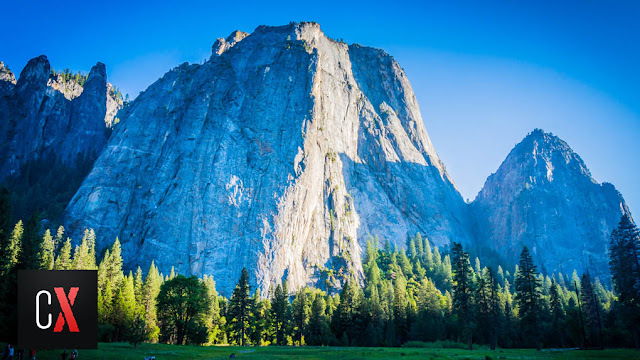 Biblically speaking, Peter cannot be “the rock upon which the church was built” simply because he was part of the church, built upon the foundation stone who is Christ. 22 In whom ye also are builded together for a habitation of God through the Spirit. The apostles (one of whom was Peter) were built upon the foundation: Jesus Christ himself. There is no other foundation than Christ! An erring human, even an apostle, cannot be a sufficient foundation of the universal institution of divinity — the church. The church must have an unshakable foundation. Somebody who cannot be affected by sin! Something that can be shaken cannot be permanent. Peter, as man, is prone to error and mistakes. 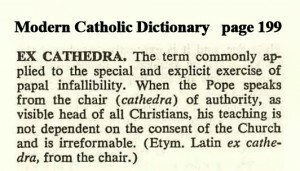 The doctrine of the Catholic Church that the Pope is the successor of Peter is infallible; ex-cathedra is a great error, even greater error than the St. Peter’s Basilica in Rome. 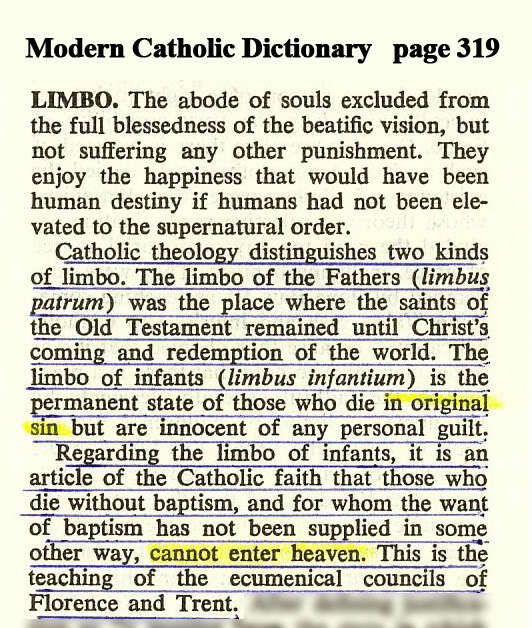 When Benedict XVI proclaimed that limbo does not exist, it implied that all his predecessors were lying when they taught that children who were not baptized before death will go to limbo! Believe in John Paul II and you will deny Benedict XVI, or believe in Benedict XVI and you will deny all the previous authorities of the Catholic Church. But I would rather believe Peter, a true apostle even if he committed mistakes, errors and sins in some of his decisions and actions because he taught only what God wanted him to teach – no more no less! 28 Saying, Did not we straitly command you that ye should not teach in this name? and, behold, ye have filled Jerusalem with your doctrine, and intend to bring this man’s blood upon us. Peter and the other apostles never taught any doctrine coming from their own thinking and inventions! The rock in which the Church of God of the bible was built is our Lord Jesus Christ and not Peter. Other religions which believed otherwise are not of God. Thanks be to God! So, why was Peter's name changed on the first place? 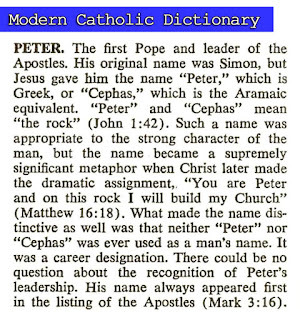 It Is Complete Lunacy The Claim By The Catholic Church That Peter Was The "Rock" Mention In The Bible When Peter Was Not Even Became A "Pope" Which Claims By The Catholic Church!! Thanks be to God for this wonderful blog! Peter is a man,a true Christian, an apostle of Jesus, not a pope of the roman Catholic church. Let not the Catholics be confused and be a reader of Controversy extraordinary blogs of Bro. Eli.. Ever learning but they will never come to know the truth. Of course this applies to catholic priest, bishop, cardinals even the pope including those heads of religion from western countries. the wrong beliefs and faith of Roman Catholic Church. Thanks be to God for the enlightenment. Thanks be to God for another eye opener blog. Kaya matatag ang Iglesia ng Dios ay dahil si Kristo ang saligan nito. 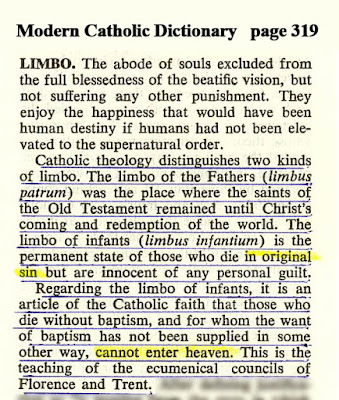 The Roman Catholic Church has many false doctrines and beliefs that are directly and blatantly unbiblical or even antibiblical. 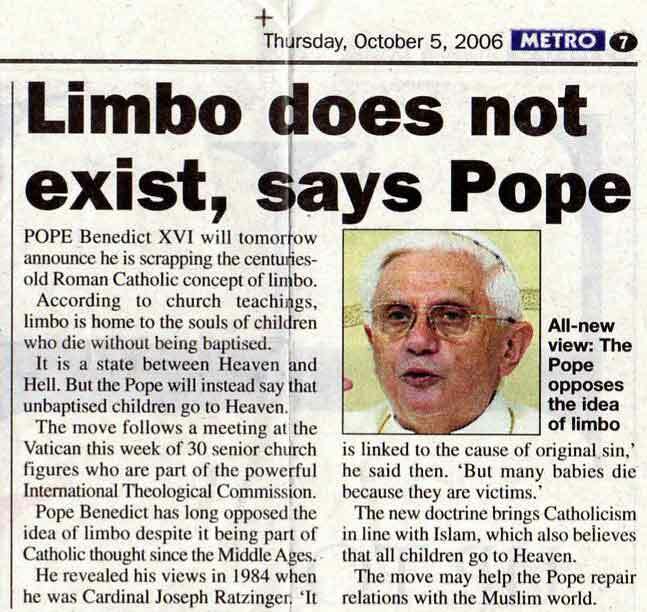 They claim many things, including Peter as being the first pope, which has no Biblical basis at all, as Bro. Eli frequently cites in his discussions and expositions. Their doctines are a direct attack and a complete opposition to God's teachings written in the Bible. I was once a part of this false religion and thanks be to God through Bro. Eli I was able to escape its clutches and be set free from its chains. To God be the glory. Every time I read an article, whether it be in magazines, newspapers, tabloids or any book, I'm very particular with the grammar it uses. I said so because it helps me understand fully the article's content. Similarly, the Bible uses grammar in order to understand its meaning. I believe that the only way to fully grasp GOD'S word in the Bible is by our desire to be obedient to His commands. As it is said in John 7:17 " If any man will do his will, he shall know of the doctrine, whether it be of God, or whether I speak of myself. 18 He that speaketh of himself seeketh his own glory: but he that seeketh his glory that sent him, the same is true, and no unrighteousness is in him"
Amen!!! Let's all be BIBLICAL! very simple explanation BUT the real sense and the truth is there. truly, nobody can deny nor reverse the real truth. Amen to that, Bro Eli. To God be the Glory! When the day that the Apostles will be raised up again, Peter, I'm sure, will be disgusted with these teachings that drags his name. Very much against the apostle's belief which is the Christian belief. John 7:18 shows us a common pattern among the speakers that God have chosen. Like Paul, Peter and other messengers of God, I have seen this trait / quality in Bro Eli. Everything he does, is for the Glory of the One that sent him. Amen to this. Thanks be to God. We are all enlightened that Peter will never be the foundation of the church but the Lord Jesus is. Peter is just part of the foundation so as the members of the church. To God be the Glory! To God be the glory! Amen. Peter is not the rock upon which the church was built. Christ is the chief cornerstone in which Peter was also built upon the foundation. 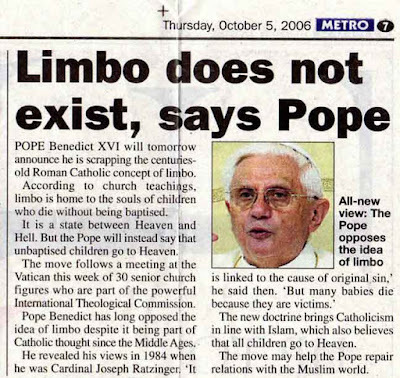 The fact that Pope Benedict XV1 have opposed the idea of limbo for sometime, we have a written basis that the Catholic religion is a commercial sect with false advocacies and teachings. this is indeed, a logical truth. It is easy to expose lies in mass media and more so in religious teachings..
St Peter a Pope in Rome?...hehehe...what a big lie. 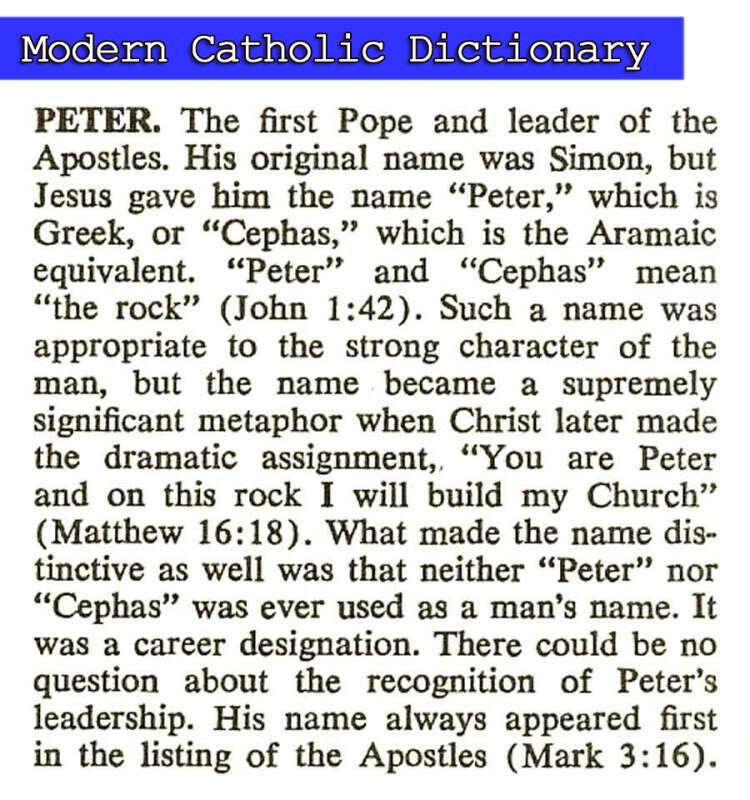 I would like to discuss Peter with you by way of a structured online discussion "Be it resolved: That Peter is the "rock" mentioned in Mt 16:18-21." If interested, I can be reached via Facebook "Abraham V. Llera." A simple and common logic tells me Peter was never the rock upon which the Church of the bible was built by virtue of this blog of Bro. Eli. The truth cannot be erased and the lie that Peter was a Pope must be erased for the truth. Can We Really See the Future?